Harkening back to the Hollywood’s Golden Age, this style delivers a vintage look that is no longer just for the rich and famous. Allow your beard to grow for three to four weeks. Shave the hair on the upper parts of the cheeks, leaving a line of hair that extends from your ear to the side of your chin. The beard should not connect to the sideburns. With your Wahl® trimmer, trim hair clean on the neck; however, you want to leave enough around the chin and jawline to create definition. Leave two vertical strips of hair connecting the chin with the mustache area. 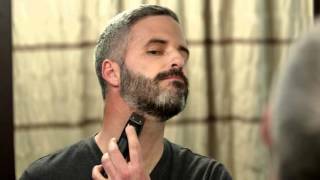 Grab a trimmer and trim the soul patch to create a perfectly rectangular shape. Continue to trim the beard as time goes on.